Gene joined Fifth Third Bank in December of 2017 as a vice president and business banking relationship manager in Sarasota, FL. He has 38 years of business development experience serving in various leadership positions for private, governmental and financial institutions. He is passionate about assisting business owners maximize their growth potential, and collaborates with companies that have annual revenues between $2 million and $20 million. Gene also has extensive knowledge of the agricultural business, particularly full time production farming entities and has consulted with agri businesses with annual revenues up to $50 million. Gene graduated from the College of Wooster with a Bachelor of Arts in History. He has been married for 38 years and has two children. His son is the Director of Governmental Affairs for the Georgia Chamber of Commerce and his daughter teaches second grade at Toledo Blade Elementary in North Port with her mother. Gene has stayed active in his community having served as a Chamber of Commerce board director and three time board chair. 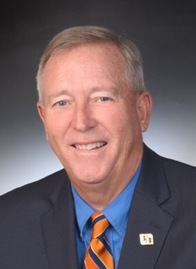 He has also held board positions with the Knox Community Hospital Foundation, The Community Foundation for Knox County, Knox County Regional Development, and director for the Southern Ohio Agriculture, Community Development and Financing Commission which covered 29 counties in Ohio. During his time with the Ohio Department of Agriculture, Gene served on numerous boards and commissions.